Momentum CD is currently available at the "Buy Now" button ONLY! Jazz pianist, composer and professor Ellen Rowe has created a collection of musical portraits of women heroes in the areas of music, sports, social justice, environmental advocacy and politics. Rowe composed pieces that are orchestrated for varying sizes of chamber jazz ensemble, ranging from quintet to octet. Some of the women included in the portraits include Michelle Obama, musicians Mary Lou Williams and Geri Allen, athletes Billie Jean King and Martina Navratilova, unsung black female heroines of the civil rights movement, singer/songwriters Joni Mitchell, Carly Simon and Carole King, animal researchers Dian Fossey and Jane Goodall, and long distance runners Joan Benoit Samuelson, Kathrine Switzer and Meghan Canfield Laws. The ensemble of players are top jazz players and in addition to Rowe, includes trumpeter Ingrid Jensen, saxophonists Virginia Mayhew, Lisa Parrott and Tia Fuller, trombonist Melissa Gardiner, bassists Marion Hayden and Marlene Rosenberg and drummer Allison Miller. 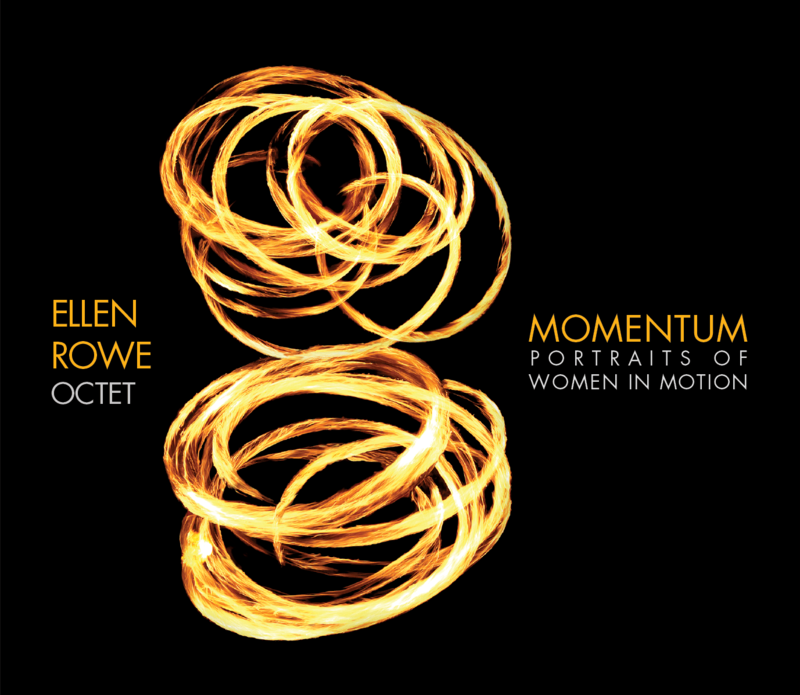 "There are two ways a listener might understand Ellen Rowe’s ambitious new album, Momentum, Portraits Of Women In Motion. One would be to consider the concept, in which Rowe pays tribute to great women of politics, music and sports, and the fact that she does so by assembling a stellar cast to play these pieces. An alternate approach would be to sidestep the album’s social content and simply focus on the music, particularly the deftly voiced horn charts Rowe has written, and the soulful, Horace Silver-style groove she pulls from the ensemble. Personally, I’d advise a bit of both. For one thing, Rowe’s writing is trying to tell a story, and if you don’t know that “Game, Set And Match” is a tribute to Billie Jean King and Martina Navratilova, then the bouncing, two-note horn shots at the beginning of the piece don’t make as much sense as when you imagine them as the sound of a volley at the French Open. But even if you don’t make that connection, it’s hard not to love the skittering drum fills Allison Miller slips between the shots, the funky boogaloo pulse she drops beneath Virginia Mayhew’s tenor solo and her hi-hat work behind Ingrid Jensen’s coolly grooving trumpet. Rowe has recruited a high-calibre crew here: In addition to Miller, Mayhew and Jensen, she has Tia Fuller on alto saxophone, Lisa Parrott on baritone, and the astonishing Melissa Gardner on trombone. As for the listener, the experience is certainly life-enhancing. Between the writing and the playing, tracks like the deeply swinging “The Soul Keepers” (a tribute to Geri Allen by way of Mary Lou Williams) and “Ain’t I A Woman” (a civil-rights tribute that’s equal parts gospel and hard-bop) are as good as mainstream jazz gets these days." the mini music label with a major attitude. To receive our monthly newsletter and special blasts about our artists, please fill in this brief form that will place you in a regional list. Then we can send you the most relevant emails and tour dates. We'll also include our special #TipsOnTuesdays section in the newsletter for those of you who are working musicians and performers! Thanks for jumping in the sled, and welcome to the doghouse! Woof! Click the "Sign Up" button below! We do a lot of things to publicize our events and workshops, but when I really want to call out the cavalry for something special, I call Jamie-Sue Seal over at Smokin' Sleddog Records. When it comes to really getting the word out, there's no one more energetic OR more capable than our pal Jamie-Sue - and we owe her for it! The triple-threat singer, songwriter and musician founded her boutique record label (Smokin’ Sleddog Records) nearly 15 years ago and now represents award-winning artists… With the right measure of sass and grit, Seal is making her mark as a musical guru. Jamie-Sue is a pleasure to work with behind the scenes. She is one of the rare promoters that works incredibly hard to make the show a success. You won't be disappointed if you book a show with Smokin' Sleddog Records. © 2019 Smokin' Sleddog Records. All rights reserved. Designed by Eric Signs. Developed by the Responsiv.RO Team.